!! THIS EXCURSION TAKES PLACE WITH A FASTER BOAT !! Children 0-3 years old, are free. Children 4-10 years old, pay 1/2 of the adult ticket price. *(﻿in each stop you will have free time to visit the place). Many reasons have made this dream island globally famous and many of us have seen magnificent pictures of it (pictures of Santorini have featured in the global promotion campaing of the Greek Tourism). 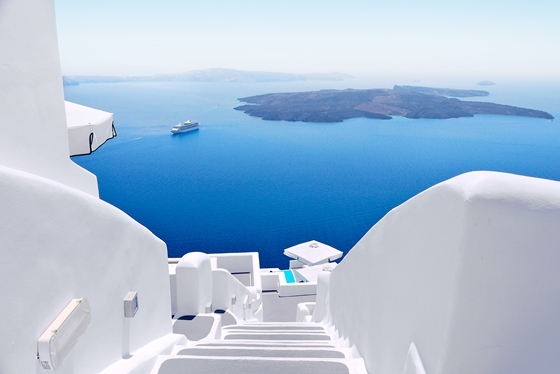 Scientists relate Santorini to the mythical Atlantis. Santorini is an ancient island, where the life of the volcano has significantly influenced the island's structure and the lifestyle of its inhabitants throughout history. Another reason that has made the island well known is the view of "Caldera", which is one of the most fascinating sceneries on the planet. The rare natural beauty, the rich history and the unique geomorphology of Santorini have contributed to it becoming one of the world's top and most known destinations. It has become the subject of study for numerous influential scientists as well as an inspiration to famous poets and writers. It is worth noting that the island was even mentioned in Jules Verne's novel "20000 Leagues Under the Sea", as well as Santorini being his main source of insiration in writing his novel "The Mysterious Island". >Arrival on Santorini at port of Athinios. >Departure from Santorini heading to Crete.